This was a wonderful escape into the world of Regency England! 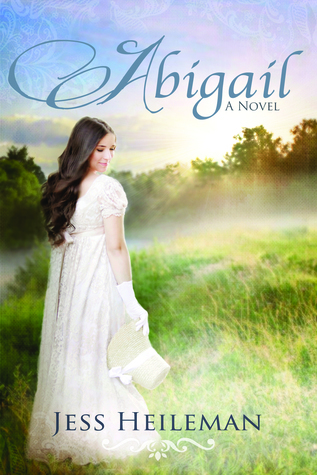 I enjoyed Abigail and her somewhat unconventional attitude, and found it interesting who she chose to placate and who she felt she needed to be disrespectful to. She and Edwin definitely have a Darcy/Lizzie thing going, and it was fun seeing their interest and attraction despite their best efforts. I especially liked the parts where they get away from the house and are able to discover the deeper layers behind each of their facades. There are family secrets that are alluded to but also unexpected and bring quite the twist to the story. Since the death of her mother, Abigail Blakeslee has lost any desire to become a debutante and enter Society. But now, foregoing her first Season has brought an unwanted invitation to join her aunt and cousins for a summer at Timpton House, the large estate of the Stanton family. Reluctantly accepting, Abigail is thrust into the vexing world of social propriety and matchmaking she had hoped to avoid. More vexing still is her cousin’s suitor, the young Timpton heir—Edwin Stanton. Moody and distant at times, remarkably endearing at others, Edwin seems a puzzle she can never solve, but can never quite put away. But then, Abigail has her own secret to hide—her own mystery to conceal. Perhaps such puzzles are better left unsolved, or perhaps love can find a solution. I marveled at his discernment, most people with perfect eyesight would fail to perceive what he did. In kindergarten, Jess won a first prize ribbon for her original creation Pigs in Wigs. It was a solid storyline: there was this pig that wore a wig–and it rhymed. Not impressed? Neither were her children when shown the very masterpiece that influenced her to become an author. “You won a ribbon for that?” Yes. Yes, she did. Thankfully, life has since exposed her to a thorough education with its share of awards and accolades–and, more importantly, to the trials and human experiences that form the heart of a storyteller and the substance of great stories. Besides her love of writing, Jess is an avid reader, shameless people observer, international café loiterer, and partially retired photographer. She loves being a mother to five amazing humans and a wife to the greatest man she knows. Giveaway Details $25 Amazon Gift Code or $25 in PayPal Cash Ends 2/27/19 Open only to those who can legally enter, receive and use an Amazon.com Gift Code or Paypal Cash. Winning Entry will be verified prior to prize being awarded. No purchase necessary. You must be 18 or older to enter or have your parent enter for you. The winner will be chosen by Rafflecopter and announced here as well as emailed and will have 48 hours to respond or a new winner may be chosen. This giveaway is in no way associated with Facebook, Twitter, Amazon, BookBub, Instagram, Rafflecopter or any other entity unless otherwise specified. The number of eligible entries received determines the odds of winning. This giveaway was organized by Kathy from I Am A Reader & Clean Wholesome Romance and is sponsored by the author. VOID WHERE PROHIBITED BY LAW. For Abigail Blakeslee, becoming a debutante and entering Society is happening far too quickly. But now, foregoing her first Season has brought an unwanted invitation to join her aunt and cousins for a summer at Timpton House, the large estate of the Stanton family. Reluctantly accepting, Abigail is thrust into the vexing world of social propriety and match making. More vexing still is her cousin’s suitor, the young Timpton heir—Edwin Stanton. Moody and distant at times, remarkably endearing at others, Edwin seems a puzzle she can never solve, but can never quite put away. But then, Abigail has her own secret to hide–her own mystery to conceal. Perhaps such puzzles are better left unsolved, or perhaps love can find a solution. After walking through the billiard room, we exited to a sizable corridor with wood archways. “This is where my father’s study is,” Diana said, pausing to knock on a large door. “Should we disturb him in his work?” I whispered. The door opened, and Edwin stood glancing tentatively between us. “She hasn’t received a tour yet,” Diana said, answering his unspoken question. “You will show us the study?” Somehow, her request sounded more like a demand. I glanced at Diana who nodded her head in encouragement. I’d said I’d have no part in her scheming, but I was now confident whatever her goal was in bringing Edwin and me together, it wouldn’t work. He saw me as a child, a little sister much like herself—though less demanding, I was sure. “Of course,” I said, and he opened the adjoining door that led into the next room, gesturing me inside. “Have you read it?” Edwin asked, peering over my shoulder. “Of course,” I answered, placing it back on the shelf. He said nothing, and his eyes drifted from mine in contemplation. After taking a deep breath he looked down at me again. He wore the stern expression I knew so well and took a step back. “I hope you are correct in your judgment,” he said with a brisk nod. As he turned from me, I wanted to call out to him, but I was too confused to contrive a response. I followed him to the study in a daze. Edwin positioned himself near the desk with his eyes cast to the floor as Diana glanced between us bewildered. The Slytons? I was familiar with the name, but surely they were not the same as I had known. My heart picked up pace regardless of what I told myself. The door opened again, and a tall, wiry lady accompanied by a shorter, burly man stepped through the door. They were older and somehow uglier, but it was them. My knees nearly gave out, and I tightened my hold on Diana’s arm for support. I cautiously turned to find Mr. Slyton inspecting me through squinted eyes. Did he recognize me? I hadn’t seen him since I was a little girl, and I hoped the years had done their job adequately enough to disguise me. I lifted my chin, attempting to appear unaffected by his presence and was relieved when Mr. Slyton turned toward Diana, appraising her with the same disgusting grimace he’d given me. I looked to Edwin and found him returning my gaze, a peculiar expression on his features. Edwin moved to my side and placed a firm hand around my waist, guiding me to the door. My ears were ringing, and I was confident he said something to me, but I couldn’t be sure. As we walked from the study, his touch retracted, and Diana took his place, directing me back down the corridor. I was uncertain where I was being led and soon found myself seated in a distantly familiar room. “Bring refreshment at once!” Diana’s voice echoed through my mind. My head was spinning, and I rested it against the chair as my vision faded into blackness. Giveaway Details $25 Amazon Gift Card or Paypal Cash Ends 2/22/19 Open only to those who can legally enter, receive and use an Amazon.com Gift Code or Paypal Cash. Winning Entry will be verified prior to prize being awarded. No purchase necessary. You must be 18 or older to enter or have your parent enter for you. The winner will be chosen by rafflecopter and announced here as well as emailed and will have 48 hours to respond or a new winner will be chosen. This giveaway is in no way associated with Facebook, Twitter, Rafflecopter or any other entity unless otherwise specified. The number of eligible entries received determines the odds of winning. This giveaway was organized by Kathy from Clean Wholesome Romance and is sponsored by the author. VOID WHERE PROHIBITED BY LAW. Giveaway Details $50 Amazon Gift Card or Paypal Cash Ends 2/15/19 Open only to those who can legally enter, receive and use an Amazon.com Gift Code or Paypal Cash. Winning Entry will be verified prior to prize being awarded. No purchase necessary. You must be 18 or older to enter or have your parent enter for you. The winner will be chosen by rafflecopter and announced here as well as emailed and will have 48 hours to respond or a new winner will be chosen. This giveaway is in no way associated with Facebook, Twitter, Rafflecopter or any other entity unless otherwise specified. The number of eligible entries received determines the odds of winning. This giveaway was organized by Kathy from Clean Wholesome Romance and is sponsored by the author. VOID WHERE PROHIBITED BY LAW.